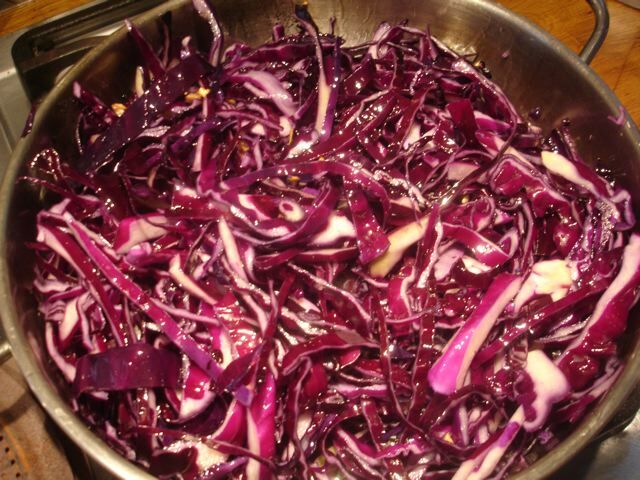 Slow cooked sausages are added to slow cooked strips of red cabbage and are slow cooked on a little, to let them get to know each other! This is adapted from a recipe in the remarkable Marcella Hazan’s 2nd Classic Italian Cook Book. For me, her books have been–still are–inspiring treasure troves of authenticity. Nothing else is needed here except perhaps a little of your favourite mustard. 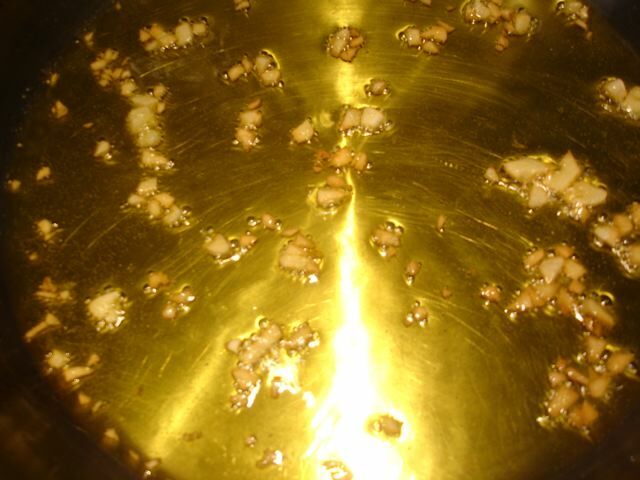 Heat the olive oil in a large pan or casserole and gently sauté the garlic until it is golden. Add the cabbage and turn it over well in the oil and garlic. Let it reduce gently–turning it from time to time–for about 20-30 minutes. 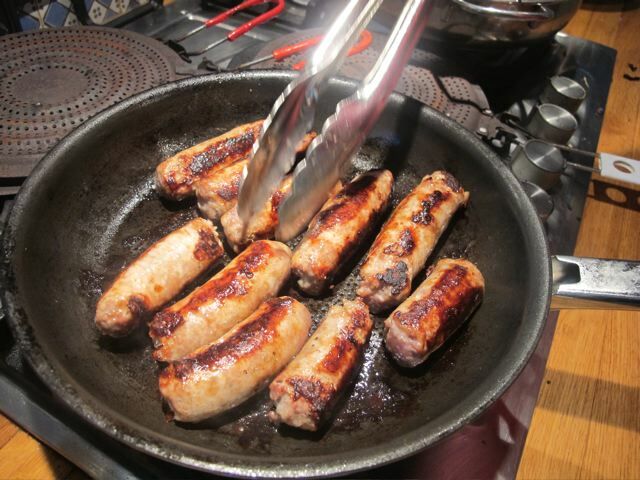 While the cabbage is cooking–sauté the sausage pieces in a separate pan brushed with a little oil. Brown them gently all over. When the cabbage has reduced, season well with salt and pepper. 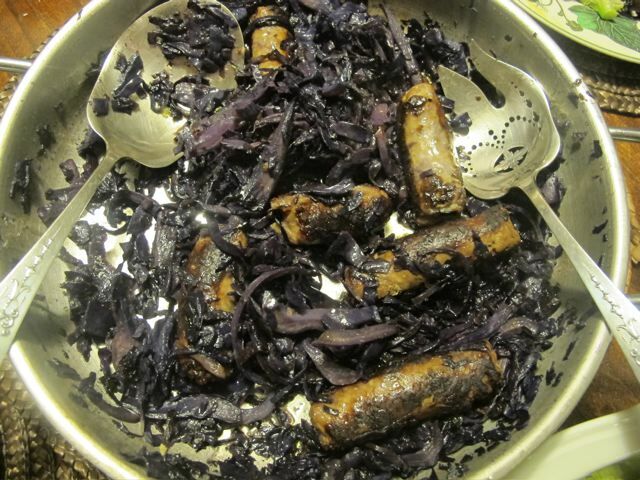 Tuck the sausages under the gleaming purple cabbage and cook them together for another 20 minutes–turning them from time to time. We had some lovely steamed broccoli with it last night–a touch of green on the plate, for colour contrast. 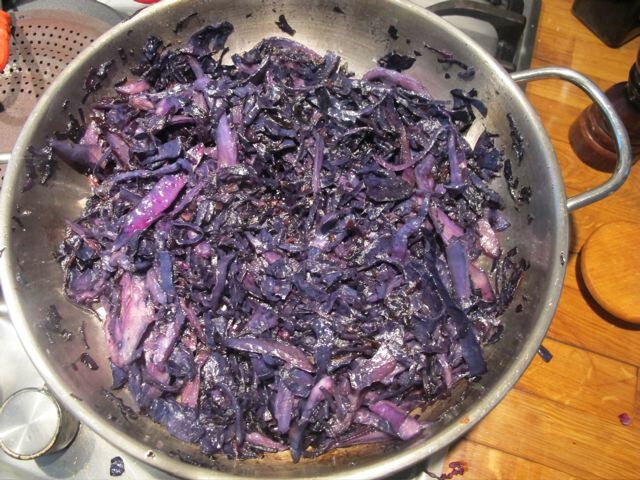 Now if only they made decent sausages here in the States…….red cabbage I can buy. (I wonder if some of your American followers will point me towards something that isn’t all bread, pork bits & fat? and herb free!) Cheers, Shelagh. Apparantly, November is national sausage month according to the local tv last night. Living in the midlands means we are very lucky with many fine sausage makers in small & lovingly produced butchers. I hope the lady who cant find good sausages can come to Europe where most tiny towns have their own speciallity wares. Dont eat them too often, then bthey become a true joy. Otherwise how about doing it yourself & starting a new trend(maybe make something of it financially). “Don’t eat them too often” is the key; naughty but nice–now and again! When we first arrived here, sausages of the British variety were virtually unobtainable but can now be found in various markets or online. 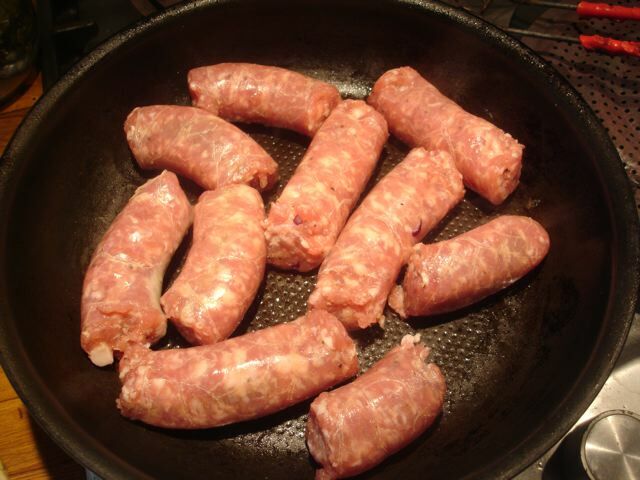 There is a great Delia Smith recipe for venison sausages – less fatty – braised in red wine. But I haven’t found a venison sausage in the 14 years since we left the UK. So it’s just a distance memory. I’ll take a look in my much thumbed “Delia”–thanks, Vanessa. Might be worth trying it with Toulouse sausage from our neck of the woods. Try the Chop Shop on Charlotte Street in Asheville. They make all their sausages and I just bought their Toulouse sausages today. Delia’s recipe is v good with any form of beef sausages & works equally well with pork & apple sausages substituting cidar for the red wine. Long been a family favourite.